Act #65: Read the fine print. Meet Fred. Well, we'll call him Fred for the purposes of this blog. Fred, a unitarian universalist, has been a professor of Middle Eastern Studies at the local college for the past 20 years. Born and raised in Michigan, Fred had the opportunity to spend 10 years of his life in Qatar where he fell in love with the region. The department has become so popular that the President has given Fred permission to hire an administrative support person. Meet Mildred. Mildred has an Associates degree in office management, and has been the secretary of a small Baptist Church in town for the past year. She has always been interested in Middle-Eastern culture. She lived and worked in Kuwait for 2 years. Prior to working at the church, she headed up support services for the College's Dean's office for 15 years until he retired. Mildred has been looking for an opportunity to return to higher education and she has heard wonderful things about Fred - so she applied for the administrative assistant position. It' a small town, so Fred knows of Mildred. Fred knows about the church that Mildred works for. Although unsubstantiated, rumor has it that it was a member of this church that held a "Burn a Koran" day. Fred knows Mildred's "kind". She probably never left the state. Probably got married when she was 18, was a stay at home mom until her kids went to school. And she probably attends church 3 times a week. One time he swears he saw her pull into the Chick Filet parking lot. Fred decides to hire a male, recent college graduate, a former student of his who has no administrative experience. He doesn't think that Mildred will "fit in" with the culture of the Middle Eastern Studies department. He worries that her faith will prevent her from being open and accepting to the students and faculty and most importantly, Fred's faith is rooted firmly in the acceptance and valuing of all people. He therefore thinks he might have issues working so closely with someone who clearly identifies as a Baptist, like Mildred. There are currently 13 states that have adopted religious freedom bills that could offer people like Fred, the legal right to discriminate against people like Mildred. My home state of Kentucky is about to become the 14th. The push for laws like these comes from a backlash against a mandate that requires religious run institutions and businesses to insure contraceptives for its employees. 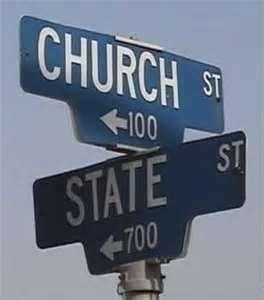 Religious freedom bills would allow individuals who hold a sincere religious belief and who disagree morally with existing laws and legislation to be able to ignore them, with no consequences. In other words, if your faith does not condone anything ranging from homosexuality, to co-habitation before marriage, to inter-racial relationships, prayer before a meal, Islam, the democratic party, women in the workplace, evangelism - and you are in a position to hire, manage, rent, or sell - technically the religious freedom bill would allow you to make decisions based solely on these factors. While on its surface, the bill seems to protect an individual's religious freedom, which I would whole-heartedly support, the bill is written so broadly that it could allow for challenges to existing anti-discrimination fairness laws protecting lesbian, gay, bisexual, and transgender individuals from employment, housing, and public accommodations discrimination throughout the state. And it would allow for people like Mildred to potentially be turned away from a job simply because of her affiliation with a Baptist church. A proposed simple amendment that would provide that the law "does not establish or eliminate a defense to a civil action or criminal prosecution under a federal or state civil rights law or local civil rights ordinance," would address these matters, but has failed to pass. If you live in Kentucky, the bill has passed the House and is now moving to the Senate. If you have an opinion on how civil rights might be impacted by the religious freedom bill, please leave a message for your Senator at 1-800-372-7181. Fred and Mildred are fictional characters created for the purpose of demonstrating the unintended possible consequences of a religious freedom bill in the state of Kentucky. Big companies are paying people just for sharing their opinions! You can collect from $5 to $75 per survey!